Today I am taking a look at Beowulf. Not the television series that has been aired recently – I quickly gave up noting the errors and accepted it as a fantasy, using some of the names from the original poem. Although since the original was a story loosely based on historical figures, I suppose any interpretation is valid. I have found that it is uncomfortable to review books set in my own period, so this time I have gone back to the sixth century. 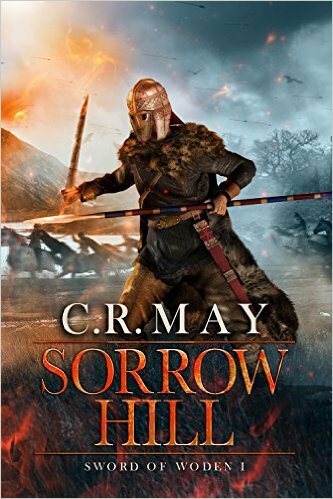 Sorrow Hill is the first book in the Sword of Woden series by C R May. I soon started getting echoes of my own book. Take a hero from a famous Anglo-Saxon poem, whose name begins with B and imagine his early life from about the age of 6 or 7 until he becomes a man. I must confess that reading this book almost made me want to put down my pen (or shut down the computer) and give up. It is difficult to believe that this is the first novel by this author. From the first scene when a young boy climbs a tall tree to catch an eagle chick, it is a beautifully written account of life in the early sixth century. Beowulf is the grandson of the king and shortly after his adventure with the eagle, and a meeting with an old, one-eyed man in the forest (it takes him some time to realise exactly who that was!) he visits the Royal Court. He is sent to be fostered by his uncle, Hygelac. The Kingdom of the Geats is at peace under King Hrethel, but there are hints that all is not well in the rest of the world. Nations are on the move and attention is turning to the rich lands of Britain across the sea – I liked the brief mention, that King Arthur is getting old. Beowulf grows up within a happy family and trains to become a warrior. This first half of the book could become boring, dealing as it does with the events of daily life. However the perfect combination of character development, the gentle drip of historical information and the lyrical description of the countryside of southern Sweden make it an easy and interesting read. The only fly in the ointment is another uncle, Hythcyn. Beowulf cannot understand why he is not as friendly and supportive as the rest of the family. After Beowulf is accepted as a full warrior, (a strange and disturbing ceremony), everything changes. King Hrethel is dead, an accident or murder? Hythcyn is now king. Should Beowulf support him or act on his suspicions? The kingdom starts to fall apart and the neighbouring Swedes invade and Beowulf is sent to hold them back. To find out what happens, you will have to read the book, but the scenes of battle are excellent. The book includes occasional touches of the supernatural, but not as much to make it unbelievable. I had a slight problem with the names, distinguishing Hygelac from Hythcyn etc, but there is a running joke about the number of people called Harald. This is the first review of this book that I have read and I think it looks like a great read. If you are into historical fiction, give it a go.